Please note: The mirror itself can t store power. And do not use the usb cord and batteries at the same time. Power Control: On/Off button located on the back of mirror. 2.Before touch the sensor switch to turn the light on, please make sure the ON/OFF button located on the back of the mirror is in the ON position. 3.Move the switch on the back of the mirror to OFF when not using, this will save standby power consumption. 4.Do not power it by USB charging and battery at the same time. You can use the USB charging at home and battery when there is no electricity like on travelling. 5.We will check and make sure every mirror is fully protected when shipped out. But if the package you receive happen to be broken during the transportation, please look out and contact with us at first time. We will take care of this. 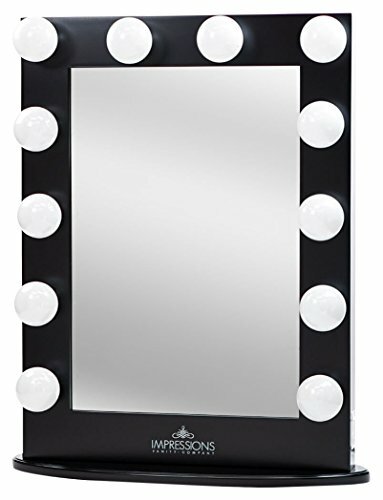 Vanity Mirror with lights: The built-in Led lights give great assistance for using in dark or poorly lit areas. LED lights on/off controlled by the touch sensor switch on the mirror screen. Two magnification options ensure that you always have the right magnification for any task. Enjoy a comprehensive view of your entire face in exceptional detail so you can look great for any occasion. 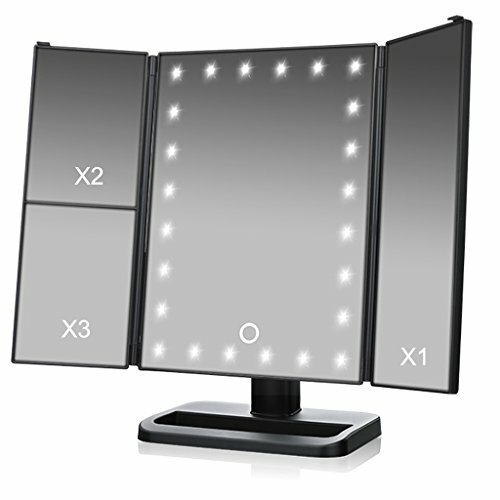 The extra large 1x (normal) mirror is great for viewing your overall look while the 10x pull-out mirror is suitable for close-up and detailed work. 16 bright ring-light LEDs mimic the effects of natural sunlight, providing you with the natural light that you will encounter throughout the day. Dimmable light function uses touch sensor technology to ensure that you always have the right amount of light during the day or night. 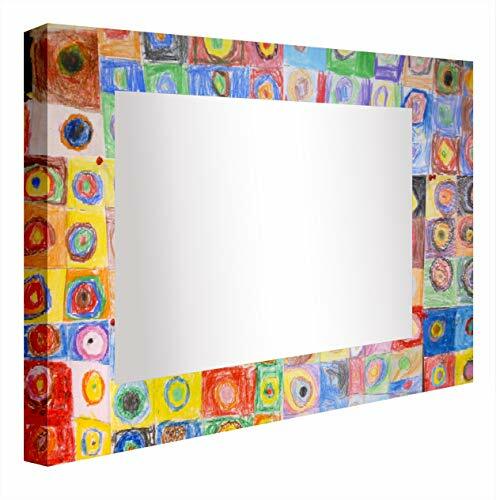 Our tabletop mirror is fully adjustable to any desired angle or position. It can be tilted 180 degrees front to back and rotated for horizontal or vertical use to ensure optimal viewing. The sturdy 5-compartment organizer base conveniently stores makeup, jewelry, tweezers, hair accessories, and more. 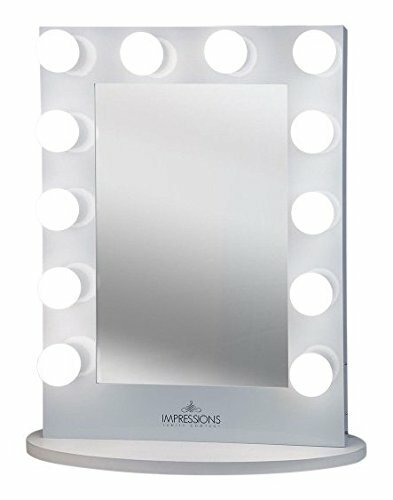 The mirror stands 15 inches tall with an elegant white glossy finish to match any home decor - perfect for use on tables, vanities and countertops. 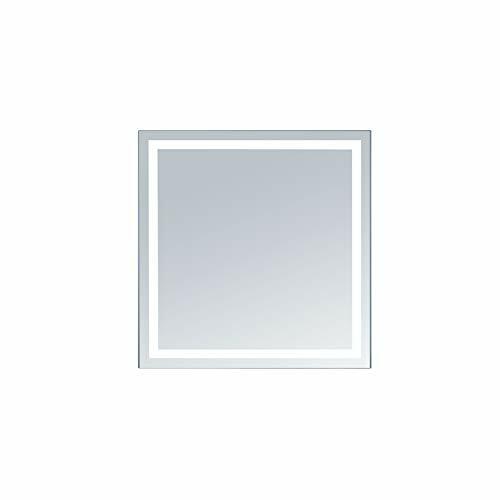 This mirror is powered by a standard mini USB cable (included) or 4 AA batteries (not included). Using smart power design, our lighted mirror will automatically turn off after 30 minutes of inactivity to help you save energy. 24 Bright LEDs, touch dimmable, 3X/2X/1X magnification, Tri-Fold design, 2 power supply options, 180 degree free rotation, large screen, lifetime LED lighting. 24 LED light up bead, high brightness, very visible to make up. Tri-Fold Design, so convenient to take with you to anywhere, packed in makeup bag. Can be used in bedroom, office, travel, dressing room, beauty salon, etc. A nice & popular gift for both men and women shaving, brushing teeth, flossing, exfoliating, makeup, etc. For all TVictory products, we back with an 18-month warranty and provide friendly, easy-to-reach support. Please feel free to contact us if you have any further questions with your purchase, such as breaks or damaged in shipping. 1. 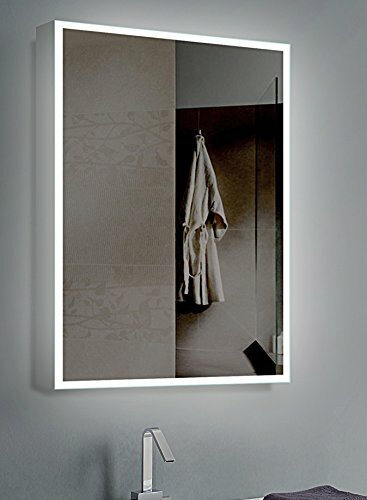 The mirror features a long-lasting, energy saving, and eco-friendly LED light bulbs that are lined around the mirror to distribute light evenly. It is long-life LED bulbs that should never need replacing. 2. The mirror itself can't store power. And do not use the usb cord and batteries at the same time. 3. Before touching the sensor switch, please make sure the ON/OFF button on the back of the mirror is in the ON position. * Slim and stylish look with quality finish matches your home decor. * Perfect gift for ladies and girls in holidays, birthday or anniversary etc. 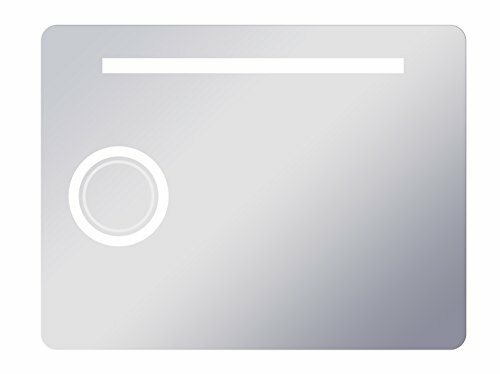 Please make sure the ON/OFF button located on the back of the mirror is in the ON position. Press the middle touch senor for few seconds and the lights will alter between dim or bright. 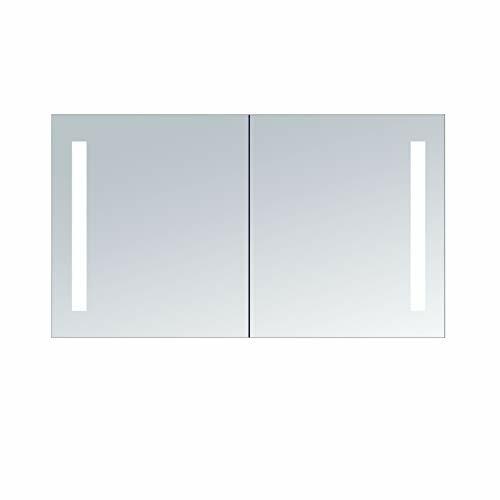 1.Please turn off the power switch on the back if you do not use the mirror for a while to save batteries consumption. 2.Please take out the batteries when you do not use the mirror for a long time. 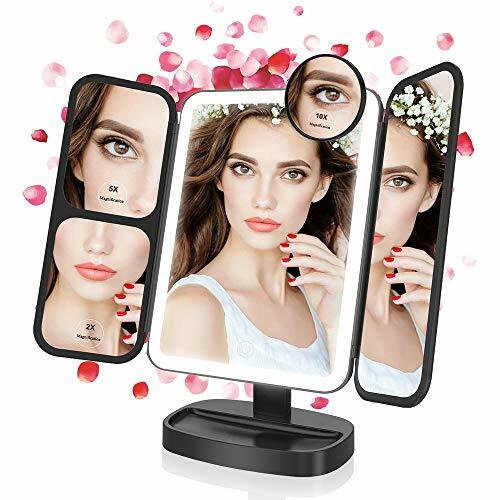 LED Lighted Vanity Mirror With built-in 21pcs adjustable LEDs, this vanity mirror provides a exact reflection of your face and helps with a most perfect application of makeup in the dark or poorly lit areas. 180 Degree Adjustable Angle: This mirror has 180 free rotation for horizontal or vertical orientation. You can adjust the mirror to fit any position and meet various needs. Base Recess is designed for the storage of some small gadgets. 12 Globe style bulbs included side-mounted dimmer two side-mounted power outlets for accessories table-top design can be wall-mounted light metal body available in black and white dimensions: 32.5 H x 24 L x 8 w.
Innoci-USA Zeus LED Double Door Wall Mount Mirrored Lighted Medicine Cabinet Vanity Featuring IR Sensor, Tempered Glass Shelves and Rocker Switch 48" x 26"
Produced in one of the highest quality mirror manufacturing plants, the Innoci USA mirrors will not disappoint. 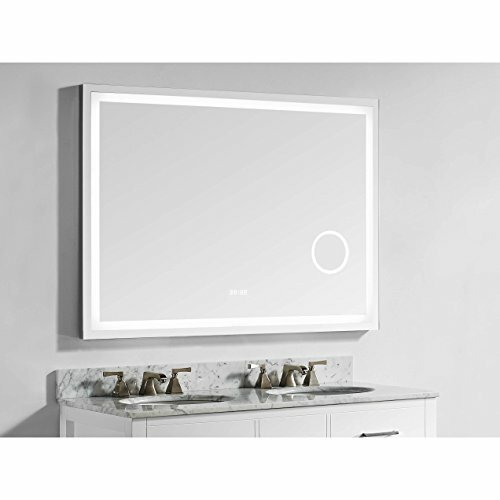 Innoci USA does not cut corners and only uses the highest quality components and bulbs to make sure that the mirror will be maintenance free and function like the day you purchased for average 50,000 hours of use. Innoci USA prides itself on providing unmatched price vs quality for all of our products. All mirrors come with a 5 year warranty. The mirrors will require 110 v electricity, they have 6000k (daylight) led color temperature. The mirror will come with heavy packaging to ensure that it is delivered damage free the first time. Innoci-USA Hera Rectangle LED Wall Mount Lighted Vanity Mirror Featuring Smart IR Sensor and Durable Aluminum Frame 24" x 32"
Innoci-USA Terra Rectangle LED Wall Mount Lighted Vanity Mirror Featuring IR Sensor, Rocker Switch and Durable Aluminum Frame 56" x 36"
Innoci-USA Terra Square LED Wall Mount Lighted Vanity Mirror Featuring IR Sensor, Rocker Switch and Durable Aluminum Frame 32" x 32"
These mirrors have a spectacular vibrancy due to the LEDs of high quality that brings in its interior. Also serves as simply as system of ambient lighting in lounges, bedrooms, bathrooms where we leave a light on but soft. 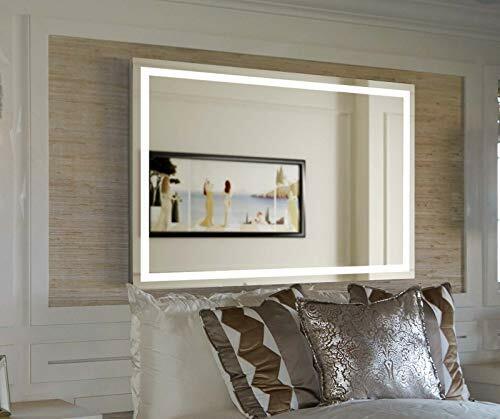 For you only have to give a side switch, installed in the mirror and you can enjoy the image as a traditional mirror. Great gift idea. It is recommended to place in any room, lounge, bedrooms, bathrooms Etc In Twilight or darkness a spectacle. 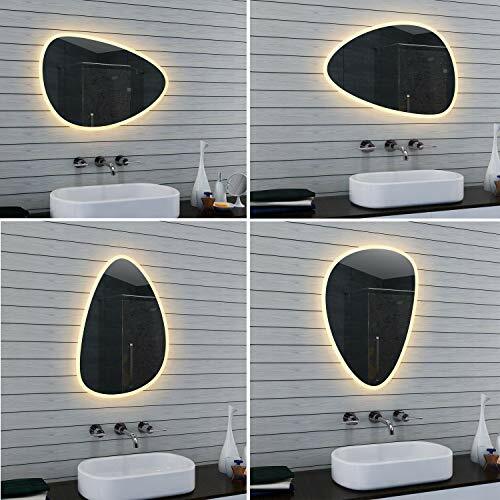 Product Features The light is evenly around the Moon and the side of the mirror with the color of the image. 3 mm moon placed on rigid iron acrylic mirror image printing on Backligt, leaving 10 cm Round; Total Thickness of 53 mm. Light with Energy Saving LEDs side switch and integrated hanging system in the mirror. Can be used as a lighting system environment, in lounges, bedrooms, bathrooms, or where to leave a light on but soft. 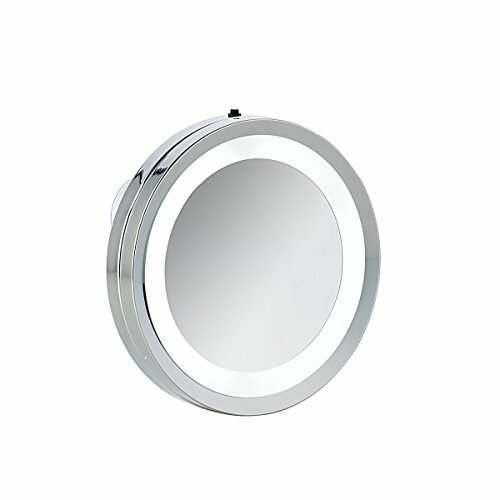 Led illuminated mirror with top bands of light with an incorporated lit zoom mirror. Surface mounted. This mirror offers 5-x magnification for cosmetic purposes. LED-technics with extremely high durability. 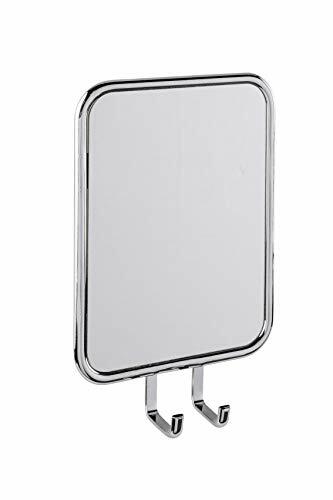 The mirror can be rotated, angled and removed with the help of the magnetic holder. The suction cup at the backside of the holder enables easy mounting without drilling or without using any tools. Battery operated (2x AA). Batteries are not included in delivery. Diameter: 13 cm. The anti-fog finishing enables a permanent clear view. High-grade stainless steel. Safe hold with the help of Turbo-Loc adhesive technique. Remove protective film and apply. Quick and easy assembling without tools and drilling. Easy to remove without leaving marks. 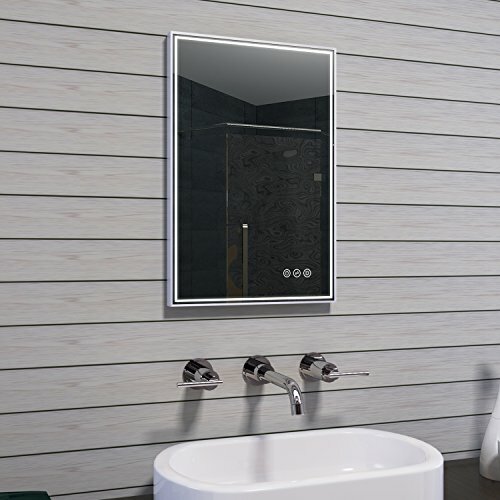 The high-quality Express-Loc anti-misting mirror Cali is made of shiny, rustproof stainless steel and, as all other bathroom accessories from this elegant series, it is of heavy quality and stylish design. The reliable anti-misting mirror provides a permanent clear view, as it is equipped with a practical anti-misting feature. The coating of the wall mirror prevents condensation from settling on the glass on high humidity environments. 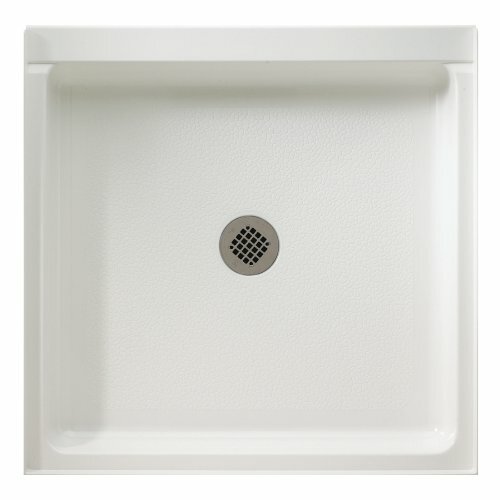 This enables you to look at yourself in the mirror while taking a shower, meaning that you can shave safely at any time. The wet shaver or towels can be kept within easy reach in the right place by means of the two integrated hooks. Mounting the practical mirror is effortless. The innovation in mounting technology is called Express-Loc ! The new Express-Loc adhesive-push system is characterised by an extremely strong hold on all suitable surfaces, e.g. tiles, natural stone, glass, concrete, metal, wood and many plastics. The Express-Loc adapters offer a clever mounting alternative to the conventional drilling, screwing and dowelling methods. Many modern bathroom accessories from WENKO can be easily fastened to the wall with this adhesive system. The mounting system offers an extremely firm hold after only 6 hours and can be permanently subjected to heavy loads. This novelty can be comfortably attached without leaving any adhesive on your fingers and can be removed without leaving residues. The expert jury of the Plus X Award has honoured the WENKO Express-Loc anti-misting mirror Cali for 2017. This excellent distinction was awarded in the category Functionality. Today, the Plus X Award is the world's most significant innovation award for technology, sports and lifestyle. The prerequisite for winning this award is: The product must be of high quality, functional and contemporary design. So you can be sure that with the WENKO Express-Loc anti-misting mirror Cali you are buying a clever and excellent product with quality seal. You have a 10-year guarantee on this product, beginning on the date of purchase. The guarantee comprises all material and manufacturing errors that impair the function. Any damage caused by improper handling or normal wear and tear is excluded. Thus guarantee does not restrict your statutory guarantee rights. You have a 10-year guarantee on this product, beginning on the date of purchase. The guarantee comprises all material and manufacturing errors that impair the function. Any damage caused by improper handling or normal wear and tear is excluded. Thus guarantee does not restrict your statutory guarantee rights. 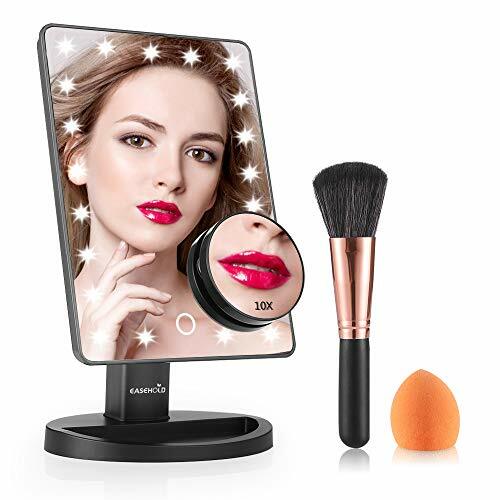 Aventia LED suction cup mirror The Handy Makeup Mirror can be thanks to the three suction cups, which is located on the back, easy to attach anywhere on a smooth surface. The beauty mirror stands out thanks to its elegant and simple design, and easily extends as additional decorations in any d cor. 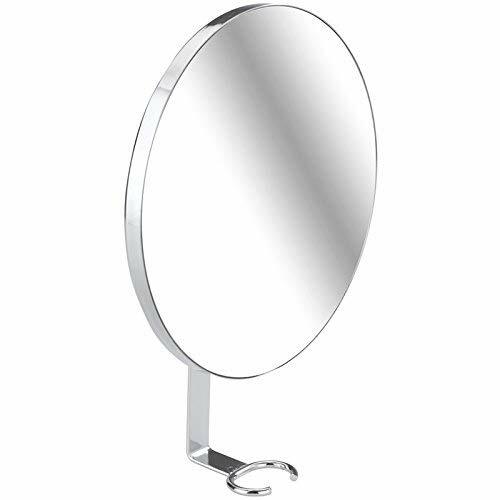 The bathroom mirror is made of chrome-plated plastic and metal and is moisture and corrosion resistant. The cosmetic mirror is very flexible and and accompanies you wherever you go. Whether in the bathroom, on a dressing table or a dressing Eraum, thanks to the handy size and shape, it is can be used anywhere and can also be easy storage while traveling. Thanks to an illuminated by LED, offers a reliable the mirror even in bad light conditions A Precise look. The handy compact mirror is a practical helper when make-up, shaving and the daily cosmetic make up. Benefits within a short time: + Magnification 3: 1 + Modern design + LED light + flexible design, on the wall or take with you on the go Product Details: Material: Plastic and metal (chrome-plated) Dimensions: approx. 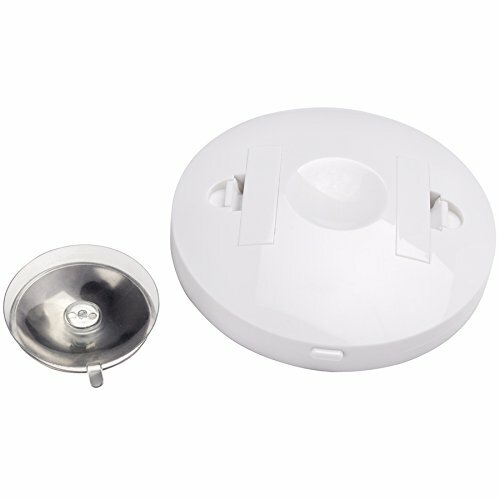 15 x 15 x 2 cm - Color: Silver with 3 suction cups Battery Powered (4 x AAA batteries, not included) Aventia Living culture the Aventia Brand stands for a wide, co-ordinated assortment of items for everyday use from the areas of home, bathroom and home fashions industry. Everyday wear designs in combination with the latest colours characterise the band image Aventia.